A hammam is a traditional Arab bath in which the cleaning is done primarily through steam and exfoliation of the skin. They have their origin in the Roman baths. 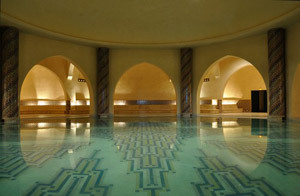 Besides the main function, a hammam is a meeting place, especially for women. Today, go to the hammam has become a tradition to meet at least once a week. Something surprising is that however much you ask, is almost certainly not find anyone who does not like going to the hammam. The traditional hammams are located in each district of Marrakech, usually near the mosques (traditionally shared the water with them). These baths have different rooms for men and women (or just different times) and has a nominal input of less than 10 dirhams. In these baths professional masseurs work so if you want a massage, you can get one from 50 dirhams. If you want to visit a traditional take with you a bath towel, slippers, Black soap & Kessa glove’s (sold in any bazaar). Once inside, just have to let yourself go. – Dar el-Bacha Hammam: Rue Hatima Zohra. – Hammam Bab Doukkala: Next to the mosque Bab Doukkala. The tourist hammams, often called spas, are more similar to the baths of Istanbul, offering innovative treatments, more carefully facilities and, above all, they have mixed rooms for couples. The prices of these local treatments usually start at 150 dirhams per person. They are located near Jamaa el Fna. About Us | Links | Contact us | Log in | Entries (RSS) | Comments (RSS) 55 queries. 0.575 seconds.